Asian lotus (Nelumbo nucifera Gaertn.) is an economically important aquatic plant that is widely cultivated in Asia. It is mainly propagated by dividing rhizomes, which maintains genotype stability but is also laborious and time-consuming. An efficient in vitro method that ensures genetic stability is highly desirable. An optimized method was developed to produce intact and sterile mature embryos by soaking fruits in sterile water containing 2% (v/v) plant preservative mixture. 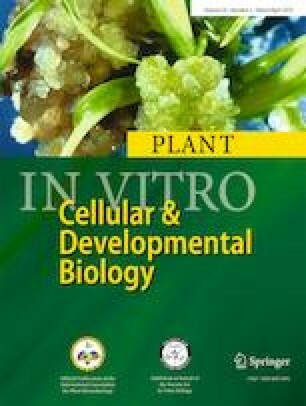 Using mature embryos as explants, an improved micropropagation procedure was established in N. nucifera ‘Weishan Hong.’ The growth patterns of explants differed with the types and concentrations of cytokinins. Media containing 0.5 to 2.0 mg L−1 kinetin were suitable for elongation of unexpanded stems, while media with 1.0 to 2.0 mg L−1 6-benzylaminopurine (BAP) the stems were shorter. Higher concentrations of about 3.0 mg L−1 BAP promoted shoot cluster formation. Liquid–solid, double-layer media promoted plantlet growth. The well-rooted plantlets could normally grow after being transplanted. Lotus is known to be recalcitrant to regeneration from callus. Apices of mature embryos, aseptic plantlets, and young embryos formed callus successfully when the medium was supplemented with 2,4-dichlorophenoxyacetic acid and thidiazuron. Callus morphology differed with respect to the source. However, only a few of the calluses developed axillary shoots. Financial supports were from the Shanghai Landscaping Administration Bureau Project (G162417, G162402) and the National Natural Science Foundation of China (31572158).